Jesus Van...Every Time I see A River cuts to the core. You still got it. 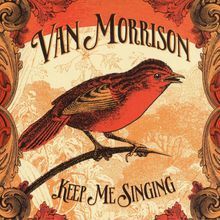 Beautiful Wonderful As Van says himself Take Me Back as a lover of Vans late 70's and 80's albums like Poetic and Hymns ...one Word Perfect Album the audio is outstanding instrumentation and arrangements spot on from the short opener to the end. The Masters voice is fantastic the expected piano licks and jaunty hammond fills are in abundance.Then there are those sublime sax and guitar led moments.I found myself singing along with every song so it works like Into the Music, Hard Nose the Highway and St Dominics from the First listen. Van is in a Good Place... still Happy to have a moan at being "out in the cold" and pretty spiritual on Holy Gaurdian Angel complete with choir,Every time I see a river is a new Morrison Standard it is a Masterpiece I defy anyone not to sing along with this amazing song.Buy this album and Please Keep Van singing and WRITING . My Best MP3 purchase for a long time...ps Chis De Burghs New album is a great album to listen to after this. Best album for a long, long time!! !